Comment: I always love an excuse to share books that illustrate beloved hymns and songs. Paul encourages us to “lay aside the works of darkness and put on the armor of light.” What would it mean for a child to do this in our world? How do we let our light shine? This Little Light of Mine shares a day in the life of a little boy who lets his light shine in the love and care he shares with others. To put on Jesus Christ is to carry his love to everyone we meet, and to let our light shine! Comment: “Keep awake therefore, for you do not know on what day your Lord is coming… you also must be ready, for the Son of Man is coming at an unexpected hour.” It is difficult to stay awake, to wait, to be ready for something that is coming at a time we do not know. It is a practice of patience and perseverance. Every evening, Little Gopher sits on the hill watching the sun set. He longs to share these vibrant colors with the people. Day after day he tries, but he cannot find the right paints. Finally, “because [he has] been faithful to the People and true to his gift,” he finds a gift of brushes on the side of the hill with the perfect colors. Lectionary Links: Sunday, November 28, 2010 by Storypath is licensed under a Creative Commons Attribution-NonCommercial 4.0 International License. 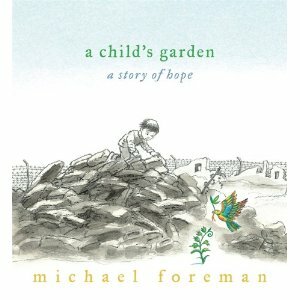 Michael Foreman’s book is extermly powerful. He addresses a crtical current situation with grace and hope. From a Christian perspective, the story relates to many different Biblical stories and themes (most certianly those of loss and hope found in the prophets; and can be a symbol of new life in the Easter season). It also speaks to the presence of children and the persistence and faith that something good will come out of disappointment and sadness. It is a book I highly recommend.